Warm wishes for all our readers of HSM Publishers. 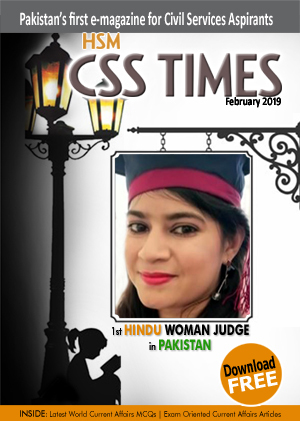 We are proudly presenting You with a new Monthly e-magazine named HSM CSS Times Magazine. This magazine is being made available to aspirants of all forms of competitive examinations. The content developed is wholly in an exam-oriented fashion – Keeping ‘You’ Ahead of ‘Them’. We at HSM CSS Times, strive to bring to Your fore factually correct and contextually current content to aid you in Your preparation. We bring forth our expertise in selecting content relevant for Current Affairs / General Knowledge syllabus of various examinations. 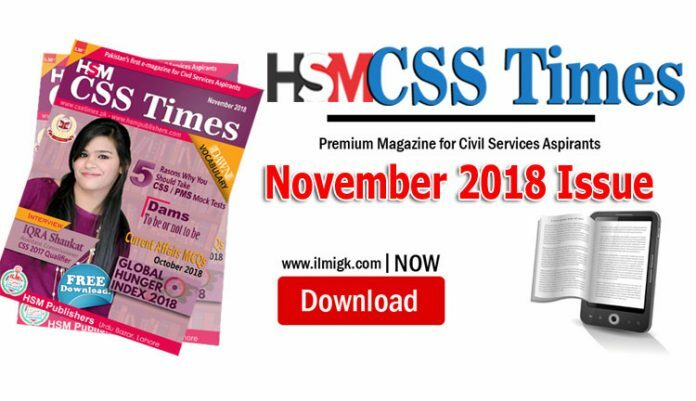 HSM CSS Times is not just another Current Affairs Magazine its more than a Magazine for CSS Aspirants. Keeping an eye on ease of reading, we have made the whole text in a bullet format for easy comprehension. The content is short, crisp and up to the point fashion. Issues of current affairs are divided into various sections of relevant subject matter. This is to make it easier for the reader to select a topic of one’s interest to read. Having said this, We, the HSM CSS TIMES Magazine, endeavor to be a part of Your success and see You have a life of Your dreams. Previous articlePlacement of Women in our society___are Women oppressed or dominant?